The Guardianship system in Saudi Arabia has been used to jail women who refuse to be ruled by the male members of their families. In the past two weeks, three feminist activists have been arrested under this system and jailed, and only one of them was released. On 15 April 2017, Saudi woman human rights defender Mariam Al-Otaibi posted on her Twitter page the following tweet: “I will not go back to hell again even if I lose my life .. Subsequently, on 19 April 2017, Al-Otaibi was arrested after her father filed a complaint against her for being absent from the house, using the Guardianship system. She decided to move to the capital Riyadh to work there and be independent in her life, but the Guardianship system can prevent her from doing so. 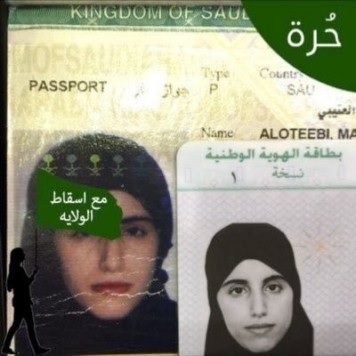 According to the latest reports received by the Gulf Centre for Human Rights (GCHR), she was transferred to the women’s section of Al-Malaz prison in Riyadh. On the other hand, Dina Ali Lasloom, according to a reliable source, is still detained in a prison for women under the age of 30, called the Girls' Care House in Riyadh. On 13 April 2017, Lasloom, a 24-year-old Saudi woman, was reportedly deported from the airport in the Philippines against her will and returned to Saudi Arabia. She arrived in Manila airport from Kuwait en-route to Australia, where she intended to file for asylum to escape a forced marriage according to some reports. She posted a video of herself requesting help for fear of being killed by her family, after the authorities in Manila airport confiscated her passport. On 18 April 2017, women’s rights activist Alaa Al-Anzi, a 23-year-old medical student, was released after spending seven days in prison for her solidarity with Lasloom. Alanzi was supported by women who had been subjected to violence. She was among those who responded to the call by activists on the Internet to meet Lasloom at Riyadh airport and ensure her safety. GCHR calls on the Saudi government to immediately and unconditionally release women’s rights activists Mariam Al-Otaibi and Dina Ali Lasloom, and calls on the authorities to abolish the Guardianship System and fully respect the rights of women citizens to travel alone and to receive protection from violence. In addition, GCHR calls upon the Saudi government to respect and protect the right of Saudi men and women to advocate for human rights and support their community members against violence and violations. Guarantee in all circumstances that all human rights defenders in Saudi Arabia are able to carry out their legitimate human rights activities without fear of reprisals and free of all restrictions including judicial harassment.